For over the 30 Years William Stanley & Sons Paving Contractors has provided both residential and commercial property owners in the Portland area with new, environmentally friendly pristine driveways. Our passion is paving and we take pride in the high quality of work we deliver with a detailed oriented paving process. Here is a step by step overview of the driveway installation process – from demolition to smooth new asphalt pavement. The first step in the asphalt installation process involves removing the existing pavement surface. Using heavy equipment we completely remove the old surface, whether it be concrete or asphalt. The surface will need to be completely clear with no grease or oil stains. The debris and old asphalt is removed and recycled. Homeowners love that fact that William Stanley & Sons adheres environmentally friendly procedures and practices. Nearly 100% of the old asphalt can be recycled into strong new durable asphalt. Grading ensures proper water drainage is achieved, preventing the driveway from collapsing. Using laser guided motion graders our specialized team grades the driveway or other surfaces to ensure that proper water runoff occurs. Water is the major cause of damage to asphalt, and if not properly graded, potholes and cracks can occur over time. All low spots are filled to achieve a proper level grade. William Stanley & Sons conforms to an optimal slope of 2 inches for every 10 feet. Or 2%. This could be the most important part of the paving process and ensures long term stability. Using heavy machinery such a drum roller, the soil is then compacted which supports the new pavement. The foundation which acts as a “frost barrier” helps reduce the damage which is a common cause of damage in the Pacific Northwest from freezing and thawing. If the sub-base is properly compacted and has the correct thickness the asphalt surface will provide years of durability. This crushed rock layer is the strength of the new asphalt surface. The crushed rock, which is mixed with oil creates a strong durable layer of strength for the new asphalt surface which will be applied next. Crucial for proper drainage, the course and jagged rock composition (usually no larger than ¾”) will then be packed into the sub-base soil. Step 5. Install New Asphalt. Once the supportive rock bases have been applied it’s time for the top layer of fresh smooth asphalt to be applied. 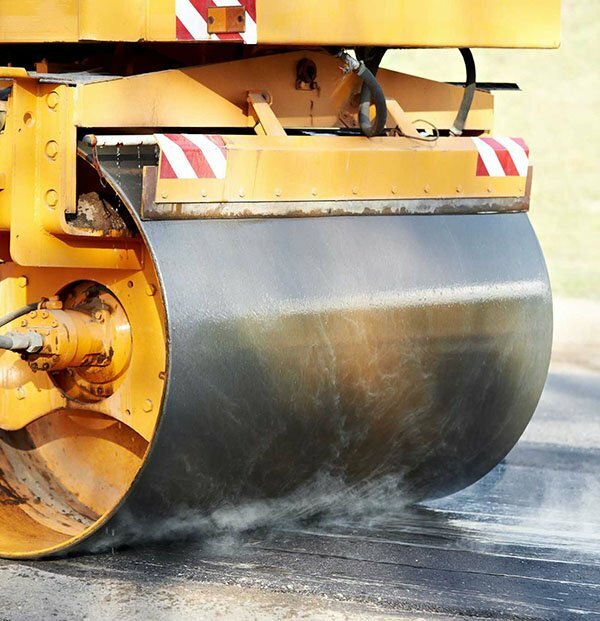 Made with a natural hot mix of sand, hot oil, and asphalt emulsion, the new layer is mixed with a smaller ½ inch rock asphalt and finer to a temperature nearly 300 degrees Fahrenheit. This combination creates a shiny, jet black attractive finish to the driveway or paved surface. Most often the new asphalt will connect to an adjacent paved surface or concrete structure such as a sidewalk. It is important that a smooth transition from the new asphalt driveway to an older connecting surface is maintained. To ensure that grading and water runoff occurs seamlessly we smooth over these transitions so that drivers or pedestrians don’t notice a difference. If transitioning from new asphalt to old asphalt a “tack coat” or pavement bonding is necessary. A thin liquid asphalt emulsion is applied to promote bonding between the two surfaces. Using a heavy duty drum roller, the final roll is applied until the asphalt is cooled off and smoothed. This final step ensures that there are no small bumps or irregularities left popping up through the new asphalt overlay surface. With over 30 years of experience in asphalt paving experience, from parking lots to driveways, we are Portland’s premier paving contractors for all your paving needs. To request an instant quote for your next paving project don’t hesitate to give us a call at 503.243.1274 or email us at william@pavinu.com.